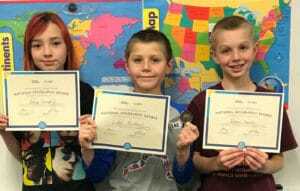 Fourth-grade students at Oak Ridge Elementary School and Pine Meadow Elementary School competed in Geography Bees at each school at the end of November. Oak Ridge Geography Bee students (from left) Daisy Campbell, Luke Rickbeil and Isaac Mancini. Oak Ridge students competed Nov. 20. Luke Rickbeil was this year’s Geography Bee champion. In second place was Daisy Campbell and Isaac Mancini placed third. The other top six finalists were Will Perius, Miles Simonsen and Barett LeBlanc. 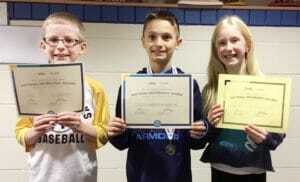 The top three Pine Meadow students are (from left) Henry Johnson, Weston Denne and Zinnia Listug-Lunde. Pine Meadow students competed Nov. 26. Ten finalists prepared to compete since the end of September in an Extensions class designed to familiarize kids with our world. Weston Denne was the champion for Pine Meadow with Henry Johnson in second place and Zinnia Listaug-Lunde in third place. Rickbeil and Denne will take an online State Qualifying Exam to attempt to qualify for the spring state competition. Leadership in Educational Excellence winners and their administrators (from left) Pine Meadow Elementary School Principal Sara Nelson; Jen Bettenberg, Oak Ridge Elementary School; Sartell Middle School Assistant Principal Zachary Dingmann; Kellie Turner, Pine Meadow Elementary School; Lori Dornburg, Sartell Middle School; High School Principal Brenda Steve; Josh Stewart, Sartell HIgh School; and Sartell High School Assistant Principal Sascha Hansen. Sartell’s Leadership in Educational Excellence Award winners are Jen Bettenberg, Oak Ridge Elementary School; Kellie Turner, Pine Meadow Elementary School; Lori Dornburg, Sartell Middle School; and Josh Stewart, Sartell High School. The banquet was held Oct. 24 at Resource Training & Solutions. Sartell Sabres PeeWee A hockey team won three games Nov. 17-18. They won 13-0 over Litchfield, 5-2 over Little Falls and 9-0 over Hermantown. Baylor Stebbins had a hat trick in each of the three games. 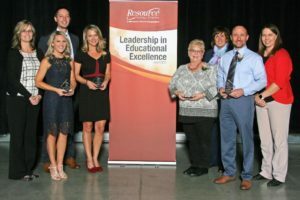 Sartell’s Leadership in Educational Excellence Award winners are Jen Bettenberg, Oak Ridge Elementary School; Kellie Turner, Pine Meadow Elementary School; Lori Dornburg, Sartell Middle School; and Josh Stewart, Sartell High School. The banquet was held Oct. 24 Resource Training & Solutions. 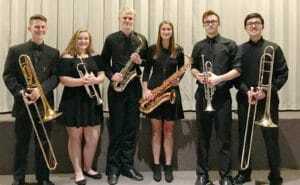 Six Sartell High School band students were selected as members of the 2018 CLC All-Conference Jazz Band. This group is made up of the top jazz students in the conference. They performed a concert at Apollo High School on Oct. 29. Band members are (from left) Connor Goad, Alexis Miller, Josh Engelkes, Emily Domres, Jack Hackenmueller and Justin Clauson.